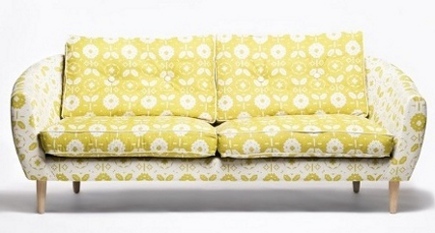 Boho sofas have fun with prints which keeps them from looking too stuffy. 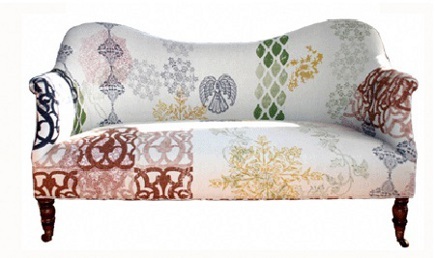 High end seating is flashing an attitude with boho sofas — seating with mixed upholstery-fabric patterns that look especially great in ultra-modern rooms. 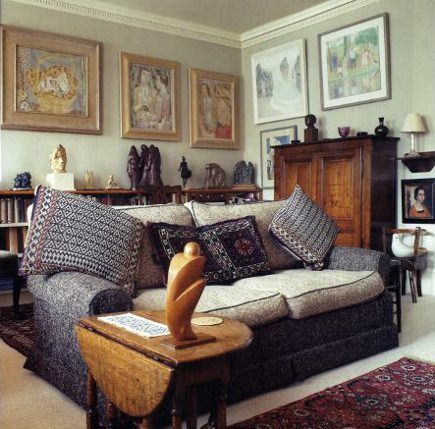 Donna Wilson’s Mabel sofa for SCP [above] combines two prints of the same custom linen fabric – light-on-dark on the feather-filled button cushions and dark-on-light for the European hardwood frame. The curved silhouette has mid-century style but is also reminiscent of historical “bathtub” sofas, which adds to the whimsy. Like an old-fashioned English suit, this nubby, tweedy wool mans up a traditional rolled-arm couch. Using a solid dark fabric on the frame and a light-colored variation on the back and seat cushions is a playful way to handle an otherwise sober fabric – particularly since it’s also accented by welting. While cleaning out some files I was thrilled to put my hands on photos of an upholstery style that I’d hoped to try if I ever replace the indigo linen sofa slipcover in our TV room. And please, don’t call it “shabby chic,” it’s a confection by Canadian designer Nina Hamilton. Getting the mix right isn’t easy. Hamilton chose five different patterns, including two rose chintzes, a red-and-white shirt stripe, sage and white gingham and a ivory-on-ivory textured print for the frame. 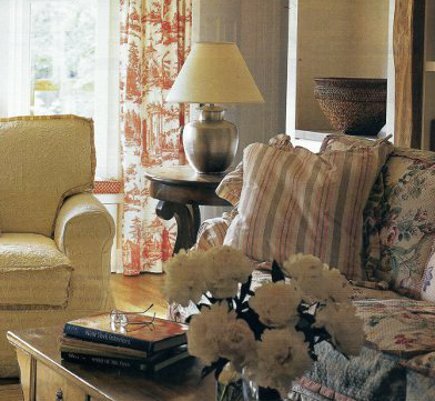 A knife-edged ruffle is used in place of welting for a definite cottage vibe. The strategy for putting a combination like this together involves getting the colors and scale just right. At least two colors must be repeated for the scheme to work, the designer noted. The scale must be varied, too. Looking closely, all the fabrics used have an ivory background, with sage and/or red. 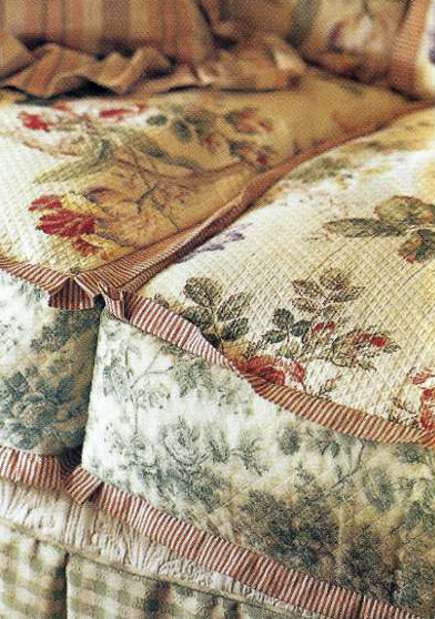 The scale of the floral on top of the cushion is larger than the toile on the sides. Florals, toiles, plaids, stripes and checks all can be mixed together. Then there’s the amazing and mysterious John Robshaw large-scale print which appears to be more than one fabric but, I suspect, is not. Robshaw’s website doesn’t include the fabric. Here, it’s shown on John Derian’s five-foot long Dromedary (camelback) love seat (though Derian’s website only offers plain neutrals). Never mind. Droolworthy is droolworthy is droolworthy (with apologies to Alice B. Toklas).